Ya gotta love Pentax. It just goes its own merry way. Just announced for the lens lineup is yet another tiny, slowish, APS-C-only prime to go with the similarly sized 40mm and 21mm, the SMC Pentax-DA 70mm ƒ/2.4 Limited. It will be introduced officially at Photo Imaging Expo 2006, which starts tomorrow, and begin shipping in October. It has roughly the same angle of view on a Pentax DSLR as a 105mm lens for 35mm (107mm-e). Excellent! Like you said, gotta love Pentax. How is a 105 (effective length) slow at 2.4? Remember the great Vivitar 105; it was a f2.5 if my memory serves me right. How do we get Sony to develop primes like this for the K-M cameras they just acquired? Contax, Canon, and Olympus OM all had or have 100mm f/2's, and Nikon had a 105mm f/1.8 AIS, if I recall. The Nikkor 105mm f/2.5 that was designed in the late 1950s was considered slowish in later decades. f/2.4 isn't bad but I wouldn't call it fast for the focal length. It's the world's first seriously long-focus pancake lens - you'll be able to stuff an *ist DSLR in your pocket with one of these on board. Photographically meaningful innovation, methinks, as opposed to a piece of technology for its own sake. 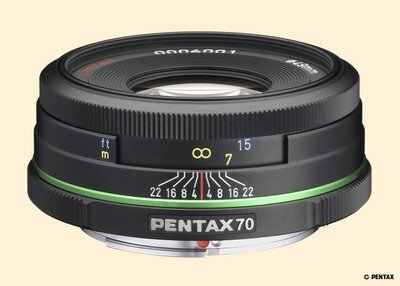 Kudos to Pentax - I hope they sell like, well, hotcakes. @donovanco, mj: Uh, the lens is as fast/slow as a 2.4 of any focal length, of course. But from the DOF point of view, it's equivalent to a 105/3.6 in 35mm (non-macro), so it's quite a bit poorer at blurring out backgrounds than the Contax, Canon, Olympus and Nikon mentioned. But given that it's so small, that doesn't take away anything from the lens -- I wish I had the bucks to buy one :P.
Weird. Where'd you get this announcement? I googled for it but found nothing in a 70mm pancake. Of course, it's in Japanese.